NEW YORK--(BUSINESS WIRE)--Firefly Value Partners, LP (“Firefly” or “we”), which manages funds that, together with affiliates, collectively beneficially own 8.1% of the outstanding common stock of Gulfport Energy (“Gulfport” or the “Company”) (Nasdaq: GPOR), today issued a public letter to the Gulfport Board of Directors (“the Board”). In the letter, Firefly highlights Gulfport’s lack of urgency in addressing persistent stock price underperformance; failure to commit to steps that could maximize stockholder value; and the current Board’s lack of necessary skills, experience and alignment with stockholders to effectively steer Gulfport’s strategy and drive long-term stockholder value. Firefly calls for steps including a $500 million share repurchase program and a moratorium on value-destructive share issuances. Firefly Value Partners, LP (“Firefly” or “we”) manages funds that, together with affiliates, collectively beneficially own 8.1% of the outstanding common stock of Gulfport Energy (“Gulfport” or the “Company”). Founded in 2006, Firefly is an investment partnership focused on fundamental primary research and business analysis, which enables us to invest with a long-term time horizon in a concentrated portfolio of deeply undervalued companies. We have substantial experience in the natural gas industry, particularly with low-cost Appalachian natural gas producers. Over the past six years, we have invested in industry-related public equities and private mineral rights. We have maintained a significant investment in Gulfport since 2013. As a large, long-term Gulfport stockholder, we have a strong interest in seeing Gulfport’s leadership create value for all stockholders. To date, we have been patient with decisions made by the Board and management, and we appreciate the time that Gulfport’s Chairman and new CEO recently spent with us to discuss our views on the Company. However, as we previously communicated to you, we have been discouraged by the Board’s lack of urgency in addressing the Company’s prolonged stock price underperformance and its unwillingness to commit to actions that we believe would maximize value for stockholders. At this point, we are concerned that the current Board does not possess the necessary skills, experience, or alignment with the Company’s stockholders to effectively steer Gulfport’s strategy and maximize long-term shareholder value. Gulfport is one of the largest and lowest-cost producers of natural gas in the United States. Most of Gulfport’s production comes from its leasehold in two areas: the Utica shale in Southeastern Ohio and the SCOOP play in Oklahoma. During Q3 2018, Gulfport produced over 1.4 billion cubic feet of gas equivalent per day, with approximately 80% coming from the Utica shale.1 In addition to substantial current production, Gulfport has over a decade of low-cost, high-return drilling inventory. Since our initial investment in 2013, Gulfport has operated a solid drilling program, delivering increasingly productive wells, minimizing costs, and efficiently developing the Company’s asset base. From November 2013 to the present, Gulfport has increased its shares outstanding from roughly 78 million to 173 million, in large part to finance acquisitions. These share issuances have been extremely dilutive, reducing stockholders’ share of valuable acreage and future cash flows. Even though Gulfport has issued approximately $2.9 billion of equity since 2013, its current market capitalization is only $1.5 billion.4 This is stockholder value destruction in the starkest possible terms. Despite Gulfport’s long-term underperformance, based on our dialogue with Chairman David Houston, we are concerned that the Board will not commit to actions we believe are necessary to maximize stockholder value. The current Board does not seem up to the task of fixing the Company’s capital allocation strategy and regaining investors’ trust. Certain of the Company’s directors appear to lack the relevant experience needed to navigate Gulfport’s business and the expectations of its investors. Other directors have served for so long that their willingness to drive change at Gulfport may be compromised. Additionally, Gulfport’s directors own just $2.4M of stock combined—roughly 0.16% of the Company. And almost all of that stock was acquired as compensation for Board service. This paltry level of investment creates a misalignment with the interests of the Company’s long-term stockholders. Thus far, our efforts to engage privately with the Board have left us questioning whether the Board’s composition must change before Gulfport will take actions necessary to maximize stockholder value. We believe that adding meaningful stockholder representation would greatly enhance the Board’s perspective. As we have discussed with the Board and detailed below, we believe that Gulfport shares are trading at a massive discount to their intrinsic value and may be worth more than $30 per share over time. We arrive at this value by discounting the future cash flows generated through Gulfport’s measured development of its Utica and SCOOP Woodford assets over their lifetime, using strip commodity pricing, at industry standard discount rates. With development of the SCOOP Sycamore or higher commodity prices, we believe that Gulfport’s intrinsic value per share is substantially higher. Discounted cash flow analysis aside, several common valuation metrics illustrate that Gulfport shares are trading at a large discount to intrinsic value. Gulfport shares trade at under four times trailing earnings and under four times EV/EBITDA.5 In our opinion, no matter how one looks at it, Gulfport’s shares are significantly undervalued. How Has the Company Responded? Unfortunately, Gulfport has done little to date to take advantage of this tremendous discount to fair value. The Board authorized $200M in share repurchases in early 2018, but after buying back $110M in shares through July, the Company inexplicably stopped repurchases through the end of Q3 2018.6 Even if Gulfport resumes repurchases under the Board’s previously-announced authorization, in our opinion that will not be nearly enough. Over the last five months, Gulfport’s share price has declined more than 20%. With significant cash on hand, positive free cash flow, and non-core assets to sell, Gulfport has been missing a meaningful opportunity to repurchase additional shares at a discount. Given that Gulfport currently trades below $9 per share, our analysis indicates that a $500 million share repurchase would create value exceeding 100% of the current share price. (2) Share Buyback: Gulfport moderately slows drilling in the near-term and uses $500 million to buy back shares at today’s price. As the table above illustrates, a $500 million share buyback would increase production and EBITDA per share over the next five years much more than an accelerated drilling program would—while preserving Gulfport’s most valuable asset: its inventory of undrilled wells. Not only do we consider a buyback Gulfport’s highest-returning potential use of capital, but a large buyback would also signal to the market that the Company is committed to improving its capital allocation. In our view, Gulfport can easily fund a $500 million share repurchase over the next 12 months using cash on hand, accelerated non-core asset sales, and free cash flow generated by the business. As of September 30, 2018, Gulfport had $124 million in cash on its balance sheet. Gulfport is also set to generate significant free cash flow. We expect Gulfport to generate more than $125 million of free cash flow in Q4 2018.8 In 2019, we believe that Gulfport can generate another $50 million of free cash flow while still growing production modestly.9 We recommend that Gulfport plan its 2019 capital budget to maximize free cash flow generation to take advantage of Gulfport’s depressed share price. Besides cash on hand and cash from operations, Gulfport has a portfolio of non-core assets that it should monetize. Gulfport’s largest non-core asset is a 22% stake in publicly traded oilfield service company Mammoth Energy Services Inc. (NASDAQ: TUSK). At current market prices, this stake is worth roughly $215M.10 In addition to its Mammoth Energy stake, Gulfport can sell non-core assets in Southern Louisiana, the Niobrara, the Bakken, and internationally. Importantly, a $500 million buyback program would neither stress Gulfport’s balance sheet nor cause the Company to incur additional debt. Finally, considering the value-destructive equity issuances of the past five years, we believe Gulfport should adopt a strict moratorium on further share issuances to send a clear message to investors that the Company is on a new path. This is especially important, as the Company recently underwent a CEO transition. The Board should reassure stockholders that it considers long-term capital allocation a top priority for Gulfport. We believe that a strict moratorium on further share issuances would show stockholders that the Board has learned from Gulfport’s mistakes and will not repeat them. Repurchase $500 million in shares over the next 12 months using cash on hand, all free cash flow generated in Q4 2018, and proceeds from the accelerated divestiture of non-core assets. Commit to generating free cash flow in 2019, and using this free cash flow to repurchase shares. Announce a strict moratorium on further share issuances and any other dilutive actions, including acquisitions, until Gulfport’s market value reaches its intrinsic value. As discussed above, the Board’s past capital allocation decisions—particularly acquisitions, share issuances, and stalled share repurchases—have destroyed significant stockholder value. We have engaged the Board in a private, constructive dialogue regarding a plan to maximize value for all Gulfport stockholders. Based on that dialogue, we are not encouraged that the Board will act in stockholders’ best interests without additional pressure from other large, long-term stockholders—or a change in the Board’s composition. We intend to continue our efforts to engage the Board in discussions regarding our plan described above, and to communicate our views on Gulfport to our fellow stockholders and the investment community as appropriate. We urge the Board to take advantage of a significant opportunity for the Company and execute on our plan. Founded in 2006, Firefly is an investment partnership focused on fundamental primary research and business analysis. Firefly invests with a long-term time horizon in a concentrated portfolio of deeply undervalued companies. 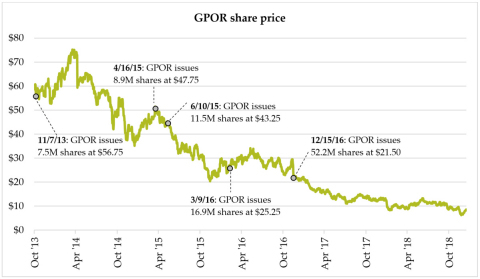 2 Performance of GPOR common stock through January 15, 2019. 2018 Proxy Statement Peer Group – AR; NFX; COG; SWN; RRC; PDCE; WPX; XEC; OAS; CNX; WLL; RICE (through closing of merger with EQT on November 13, 2017); QEP; SM; EGN (through closing of merger with FANG on November 29, 2018); LPI. 4 Based on closing price as of January 15, 2019. 5 Source: Capital IQ as of January 15, 2019. 7 Assumes forward strip pricing net of basis differentials as of January 15, 2019 and NGL realized price 40% of WTI. 10% discount rate on future free cash flow. 8 Source: Company guidance and Firefly analysis. 10 Based on closing price on January 15, 2019.